AUGUSTA, Ga. » There is nothing to prepare you for what you're about to see once inside the grounds of the Augusta National Golf Club. Outside the hedges that have guarded this place for 70 years and will do so for 70 more, it's a typical southern city filled with strip malls, motels and fast-food joints that cater to those who live here and those of us passing through. The traffic is heavier than the humidity that hangs around Georgia from spring to fall, something you notice while waiting patiently to get inside the gates. Even when you're in, you pull into a parking lot capable of handling the thousands of people who wait their entire lives just to see a Monday practice round, let alone the Masters itself. Long lines of excited patrons stream back from the entrance as each carry-on item is examined carefully. No cellphones, no beepers, no electronic devices of any kind are allowed on the grounds. If caught with one of these once inside, you will be escorted from the premises, never to be heard from again. Even members of the press are told not to take their cellphones on the course or face the consequences of having your badge removed from your shirt. 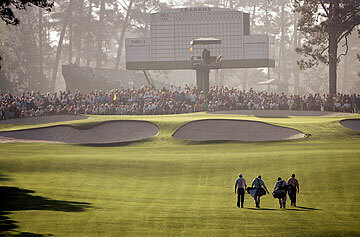 "There is no gray area here," Associated Press golf writer Doug Ferguson told me on Monday. "If you've got a phone in your pocket and they notice it, you're gone. No questions asked." THE FIRST THING you see as you come inside is a large mall area where a huge gift shop is located to your right that sells everything with a Masters logo on it from playing cards, to golf balls, to umbrellas, chairs, jackets, hats, you name it, the logo is on it. One patron told me he was in the shop for one hour, spent $900 and still had more to buy for all the folks back home. To your left is another large, Masters-green-building that houses a museum of wonderful memories dating back to the first event here won by Horton Smith in 1934. On the walls are several quotes by Gary Player that read better than Shakespeare in his heyday. You are treated to all the different kinds of trophies that are awarded to not only the winners, but for those who make eagle, double eagle and holes in one. This tree-lined area also has a concession stand and, of course, the media room, which is as large a building as any on the grounds. At the front of the room stretches an electronic scoreboard on top as well as an old-fashioned scoreboard that lists the scores of every golfer in the event. THERE ARE NINE television screens to the right that show images of each hole on the back nine. The room itself houses at least 300 members of the media from all points around the globe. There are even clocks above the scoreboard that remind you of the time in the United Kingdom, Augusta, Japan, South Africa, eastern Australia and western Europe. But even all of this doesn't prepare you for what awaits outside. Once clearing the mall area, you look out across this wide expanse of fairways, greens and trees with wonder. It looks like a giant picnic where patrons stroll through the grounds that can't be done justice by video or still pictures, alike. The fairways are as wide as a football field. The pine trees stretch 100 feet toward the sky. You could fit Waialae Country Club comfortably on the front side and still have room for Maui's Plantation Course on the back. "First time here, sir," a marshal asks me as I stand there with my mouth open wide. "Nothing like it, is there?" What you notice right away are the 60,000 people scurrying about like colorful ants on a hill. It's crowded, no denying that. But it isn't uncomfortably so. "How do I get to Amen Corner?" I asked. "Go down to the 10th tee over there and start walking," the marshal said. "You'll see it, soon enough." ONCE THERE, IT'S like looking at the Mona Lisa. There it is. The bridge across Rae's Creek at the 12th. The azaleas and dog woods in full bloom. You stand there remembering the black-and-white images you saw as a child when Arnold Palmer charged through here like a member of the Light Brigade. You walk on, to the 13th, to see the same creek guarding the front of the green, daring you to hit your second shot in here to a green that tilts back toward the water at an impossible slant. All the greens have undulations on them TV just can't capture. The course is so hilly, by the time you've walked all 18 holes, you're too tired to write a single word. 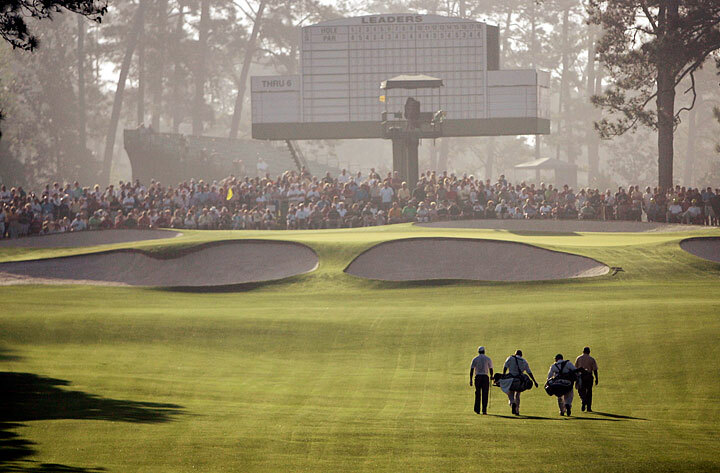 The par-3 16th is filled with as many people as memories. What you notice right away is how knowledgeable these people are. They know this course as well as Jack Nicklaus and don't mind telling anyone willing to listen. BY DAY'S END, you stand in front of the white plantation houses that are to the left of the mall area near the first tee and 18th green and marvel at their pristine beauty. If fortunate enough to stand on their back porches, you are treated to the sun setting on the course that resembles a Civil War battlefield as much as anything. "Sir, may I see your badge?" I was asked by a nice southern lady. "You can stay if you like, just don't go out on the course. They're mowing the lawn." Instead, I exited back through the mall area to the parking lot, glad I had another six days to soak up the atmosphere of this special place. I can't imagine what it will be like on Sunday when the roars across this 7,445-yard course will tell the tale of who will win and who will come agonizingly close. Outside the hedges, the ever-changing real world awaits. Inside here, time stands still.